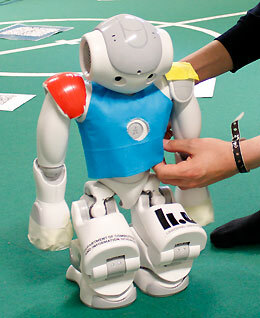 At the end of June, six LiU robots will be going to the RoboCup in Leipzig for the world football championship. They’ll be dressed in specially sewn small vests in LiU blue, produced by skilled LiU employees. The sewing machine in the Communications Division is running hot. 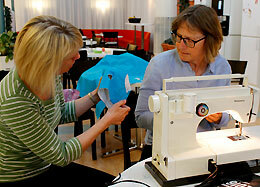 Lotta Perhammar and Monica Westman are finishing up a prototype for the vests in LiU blue that the robots will be wearing when they compete in the world football championship for robots in Leipzig, from June 28 to July 4. Raise your arms, please! When the robot tries the vest on, it turns out to be a bit too wide. It needs to be taken in round the waist and the lining needs to be a colour other than white. Nine people and six robots from LiU will be going to the RoboCup. Football is only one of several branches of competition; other robots are competing in other sports, and there is a special branch for rescue robots and for service robots. The football team is mixed, but by coincidence it consists entirely of women all named after Disney figures such as Elsa, Ariel, and Pocahontas. If any of the robots run into trouble during the competition, there is a robot hospital. Immediately after RoboCup, the robots will travel on to Almedalen, where they’ll be shown during Politicians’ Week. It will be a hectic summer for both the robots and their team leader, Fredrik Löfgren.